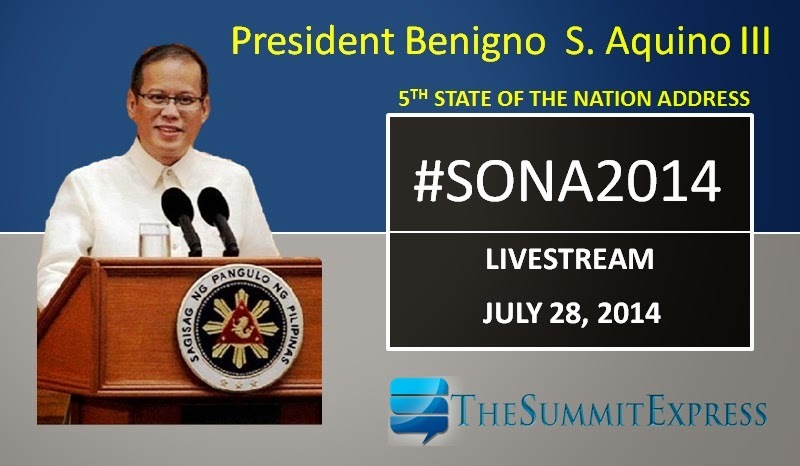 Manila, Philippines - Radio Television Malacañang (RTVM) provides official livestream video feed for the 5th State of the Nation Address (SONA) 2014. President Benigno "PNoy" Aquino III will report to his 'boss', the Filipino people for his performance and government accomplishments today, July 28, 2014. PNoy will deliver his fifth SONA before the second regular session of the 16th Congress at the Batasan Pambansa, Quezon City. It is mandatory for the President to deliver the annual SONA according to the Constitution. One major function of RTVM according to EO 297 is to provide full coverage and broadcast production of events of national significance and special celebrations involving the President. Watch: 2014 SONA of President Aquino live from Batasang Pambansa, Quezon City. Livestream video courtesy of RTVM. It will be available around 3:00 in the afternoon today. It is expected that major television networks in the country such as ABS-CBN, GMA and TV5 will have their own coverage and livestream feed of the 2014 SONA. Once available and feasible to share, it will be embedded here. Be updated on the country's current state and performance. Leave your comments now if you're satisfied with the report of the President and if you have suggestions on how to improve different aspects of the country such as economy and tourism, education, health and environment, foreign affairs, justice and national security.